« A Question for YOU, Dear Readers . . . Compare the honkin' magnets on the installed Quarter Pound to those of the factory pickup. The original P-Bass is a fascinating instrument. It’s wasn’t the first electric bass guitar—inventor and owner Paul Tutmarc claimed that title with the instruments he created and sold through his Seattle, Washington, music shop in the 1930s and ’40s. But the P-Bass, released in 1951, was the first electric bass that really mattered—the one that made the instrument a fixture of our musical landscape. 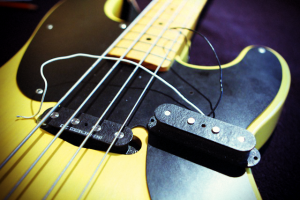 The original P-Bass has a modest, unassuming sound. It’s not so much loud or bottom-heavy as compact and midrangy. But I love using my Japanese-made 1951 Precision reissue anytime I want a rootsy, old-fashioned sound. While many insist that great bass parts are felt more than heard, the instrument harkens back to a time when parts were often heard more then felt, since ’50s pop records have little if any low end. I was skeptical when I swapped out the factory pickup from my resissue ’51 for a Duncan Quarter Pound for Single-Coil P-Bass. Not that I thought it would sound bad—I simply suspected that it would make the instrument sound too much like any old modern Fender bass. So I was delighted to discover that, yes, the pickup changed the sound, but the instrument lost none of its charmingly humble character. The tone simply became more defined, with a stronger fundamental and sweeter overall resonance. Check it out: Here’s a cue I made for a project that needed a trashy, swamp-rock vibe. The drums are distorted, and the guitar are slathered with scuzzy reverb, but the bass cuts through loud and clear. I dig it. But still, I’d really like to get my hands on a Tutmarc some day. Is there a 1930s Tutmarc bass taking up valuable space in your garage? I'll take it off your hands for ten bucks—cash! I JUST started playing bass about 4 weeks ago because my fiance and I are going to play a song at our wedding. How hard would it be to change my pickups? I’ll give a fast, honest answer. Anyone can do it, but if a) you’ve never attempted it, b) lack experience with tools like soldering irons, and c) are under a stressful deadline like YOUR OWN WEDDING, it’s probably best to take it to a pro, or better yet, a friend who can teach you. Congrats, by the way. I too married a musician I love creating music with, and highly recommend the practice. @Leilana It’s pretty easy. Remove strings, remove screws, unsolder the old pickup, solder the new, put screws and strings, done. @Joe That sounds nice, what guitar, amp and effects in the mix you used? Thanks! The main guitar is my old Strat. The harmonica-sounding thing is a distorted melodica. The amps and effects were all created using Logic Pro software. And the reverb is an impulse response I made from an old Real Tube rackmount reverb. (I’m planning a post soon on making your own reverbs in software). That Tutmarc looks wicked. I love the look of those early-20th century mad scientist prototype gadgets; those big expanses of wood or sheet metal punctuated with a knob here and there. 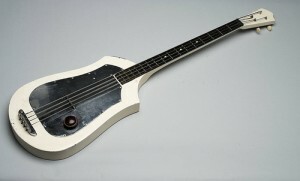 The early P-bass and telecaster may have been the last of these type of designs. Oh, I so agree! I’ve always thought someone could have a huge hit in the guitar business with a really cheap guitar with that sort of uncompromisingly un-ornamented look. Something with a Les Paul Jr.-type functionality, but more minimal and industrial. Like out-Fendering early Fender.